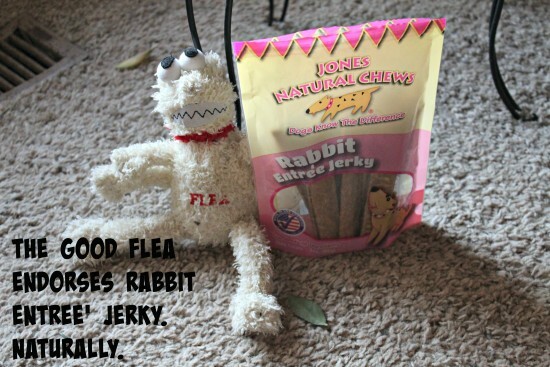 ENTER NOW TO WIN JONES NATURAL CHEWS RABBIT JERKY – DAILY TWEETS! I have four dogs. I have one bag of rabbit jerky. 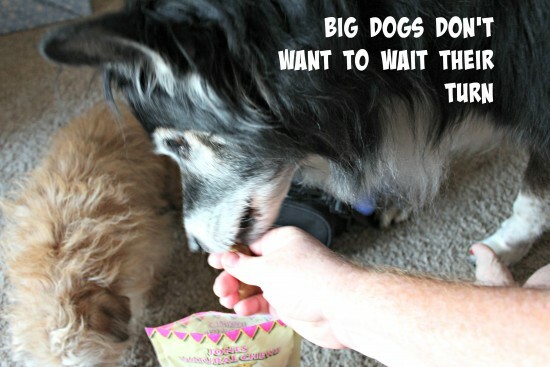 Two dogs are big and two dogs are little, but this doesn’t influence the order in which they get their treats. 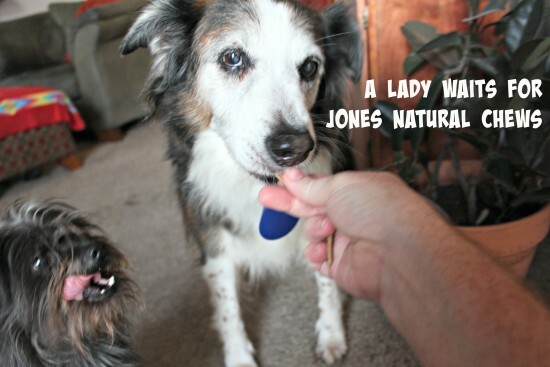 Today’s post is a reminder that there’s an ongoing giveaway for yummy Rabbit Entree’ Jerky from Jones Natural Chews, as well as a photo illustration of good dogs waiting patiently for their treats. Not. The beauty of the rabbit jerky, and any of Jones’ jerkies, is that it’s somewhat thin and is a hard jerky. The size and shape is uniform. The ingredients are three – rabbit, rye flour, salt – and the sticks snap easily into smaller pieces. I was snapping them with one hand, even when they were probably too small to have to snap. I like to make the treats last a long time, so I snap them into smaller pieces. I also don’t like to give small dogs too much. Treats are dessert, not meals. I wouldn’t give a toddler a one pound bag of M&Ms, and I’m sure not going to give a dog a whole bag of treats. Not even my big dogs. And they’re okay with that. Well, kinda. Flash is a little grabby. It’s his mother’s fault. She is, too. 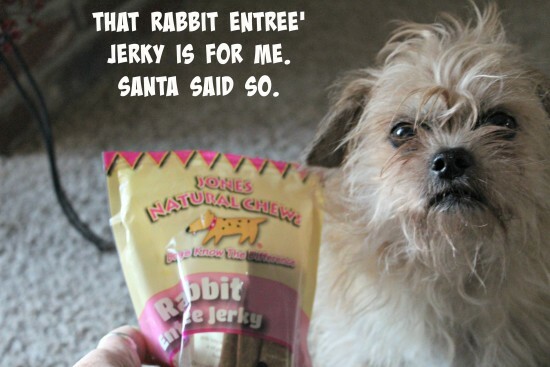 *ahem* So, the point is, I use the Rabbit Entree’ Jerky as a reward, usually, when the dogs obey. Or when they sit pretty for photos and wait patiently for their turn. They’re not very good at that. Chewy is probably the worst at waiting his turn. 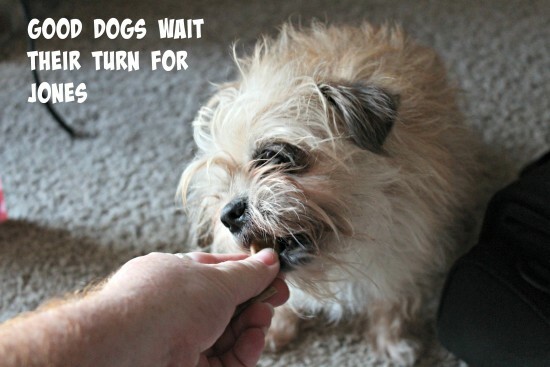 He’ll jump up and take a treat out of Flash and Patches’ mouths. Bad dog. I hear he’s on Santa’s naughty list. But Gadget is on Santa’s good list. Or so I’m told. All that said, your dog wants some rabbit jerky. Don’t deny it! 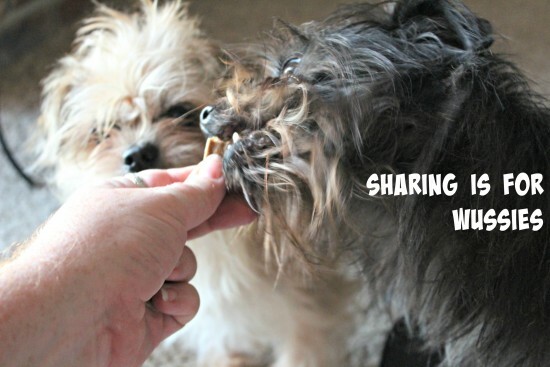 And one way to get this yummy treat for your dog is to enter the jerky giveaway! Click on this sentence and it will open a new page with the giveaway and instructions on how to enter. It’ll make your dog smile if you do. Naturally.